Egyptian Archaeologists Unearth A 4,400-Year-Old Tomb : The Two-Way Unusual paintings and well-preserved artifacts were found outside Giza in the tomb of Hetpet, a priestess to the goddess of fertility. The country hopes to draw more tourists with the discovery. 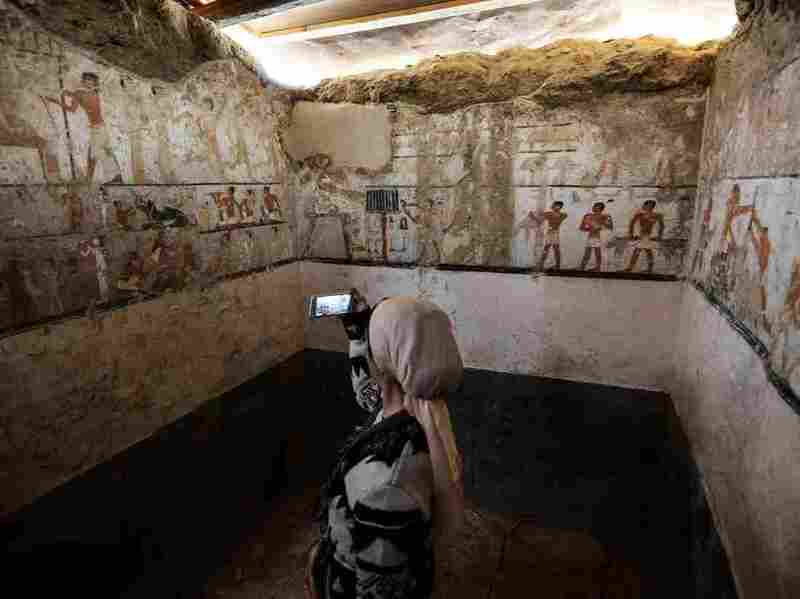 A woman takes a photo inside the tomb of an Old Kingdom priestess that was unveiled on Saturday after being discovered during excavation work in Giza's western cemetery by a team of Egyptian archaeologists. Egyptian archaeologists unearthed a well-preserved 4,400-year-old tomb from Egypt's Fifth Dynasty, a prosperous era where pharaohs ruled, palaces were erected and pyramids were built. Antiquities Minister Khaled al-Enany said that the tomb belonged to Hetpet, a priestess to the goddess of fertility Hathor. Female priests were not common in ancient Egypt. Hathor, who also represented music and dance, had a number of them in her priesthood, reports National Geographic. The tomb was discovered in Giza's western cemetery by a team of Egyptian archaeologists at the helm of Mostafa Waziri, the secretary general of Egypt's Supreme Council of Antiquities. al-Enany told reporters during a press conference on Saturday that the cemetery where the tomb was found is home to the graves of other official figures from the Old Kingdom's Fifth Dynasty, which spanned from 2465 BC to 2323 BC. Hetpet's name and various titles are engraved inside the tomb, alongside paintings and other artifacts including a purification basin. "The tomb is in very good condition," Waziri told the Agence France-Presse. "There are colored depictions of traditional scenes: animals grazing, fishing, bird-catching, offerings, sacrifice, soldiers and fruit-gathering." The paintings — which Waziri says are unusual — show scenes of music and dance. One scene features two monkeys eating fruit and dancing in front of an orchestra. 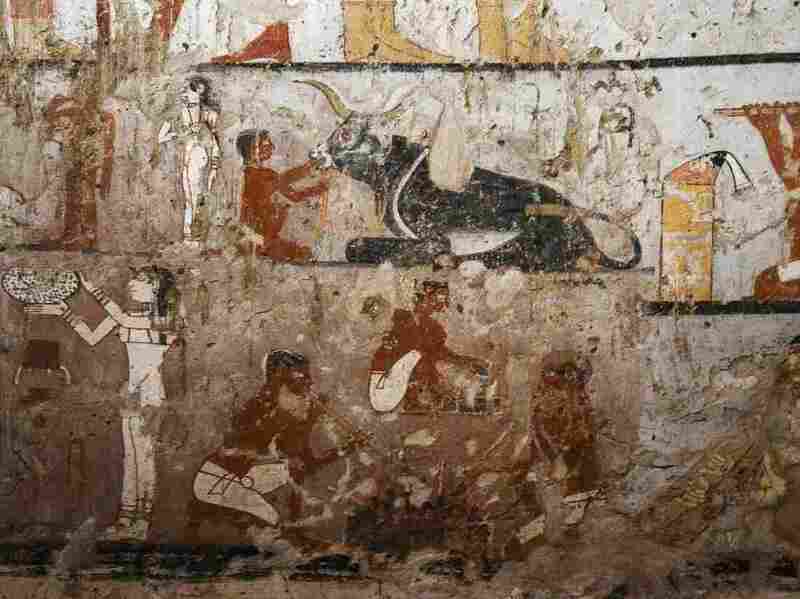 "Such scenes are rare ... And have only been found previously in the tomb of Ka-Iber, where a painting shows a monkey dancing in front of a guitarist, not an orchestra," Waziri told the AFP. Since the overthrow of the dictatorial Egyptian President Hosni Mubarak in 2011, the country's once-booming tourism industry has sharply declined. The Supreme Council of Antiquities has made several discoveries throughout Egypt since the beginning of 2017. The ministry hopes that its recent string of archaeological progress will entice more tourists to visit Egypt. "This is a very promising area. We expect to find more," al-Waziri told reporters at the site.